On February 3rd, 1990, a Queen was born at the Regal Theater in Chicago. 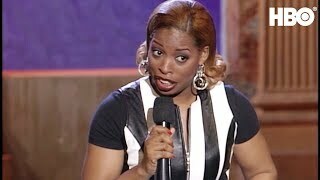 Adele Givens has done it all! Adele was crowned winner of the Crown Royal Comedy competition in the city of Chicago on February 3rd 1990. Since that day Adele has realized that she was destined to become comedic royalty. Since then Adele has the rare ability to make you laugh, think, cry, and cringe all at the same time!! Her famous catch line “I am SUCH a #$%@#% Lady” has gone viral. Her work is popular and she can be heard on songs by Big Sean, Lil Kim, The Brat! Her bold and on point insights continue to delight and amaze her fans and peers alike. Popularity was swift with Adele winning many other competitions and securing the respect of comedy lovers everywhere. Almost immediately fans proclaimed Adele Givens the Queen of Comedy. The title is well deserved with such credits as Russell Simmons' Def Comedy Jam, The All Stars of Def Comedy Jam. Showtime at the Apollo. The Oprah Winfrey show. HBO Comedy half-hour, Comedy Central Presents, Queen Adele has certainly reigned supreme.It wasn't long before Queen Adele made her acting debut, guest-starring in such sitcoms as Martin, Moesha, The Parkers, The Steve Harvey show, a recurring role on The Tracey Ullman show and becoming a series regular on the hit sitcom The Hughley’s to name a few. Loving her newfound tree, Queen Adele branched out to do her very own morning radio show (The Adele Givens morning show on WGCI 107.5 FM Chicago), but not before filming her first movie role as Tricks in the film, The Player’s Club. Before long, HBO recognized her majesty by offering her a chance to do her own HBO Half-hour comedy special and television pilot The Adele Givens show. Adele also served as co-host of the Source Magazine Awards pre-show. Queen Adele Givens wowed audiences everywhere on the very successful Queens of Comedy tour (13 consecutive sold out dates and the album was nominated for a Grammy Award), and made us laugh out loud as the hip hop loving, bad hair day having, DJ (I’Holla) Helen in the movie Beauty Shop.Now the Queen of comedy, Grammy nominated artist, Soul Train Comedy Award nominee, and experienced television and film actress, had added the titles writer. Producer and Director to her resume. She is currently filming a movie she wrote and directed (The real extreme and confusing blaxploitation of ….SCANKHOSE.) All this and beautiful too! It’s safe to say that the little girl from Chicago’s west side has done the city proud! On February 3rd 1990 Queen Adele Givens was crowned the winner of the Crown Royal comedy competition at the Regal Theatre in Chicago! ALL HAIL THE QUEEN!